Posted on September 30, 2013 at 9:48 pm. Ealier this year, I went to the Pervasive Media Studio in Bristol to give a lunchtime talk about x-OSC. After the talk I got to speak to some of the resident artists/technologists and hear about the some of projects going on at the studio. One of the artists was Helen White and she told me about the solar wind chimes piece she was creating as a part of the communicating science residency. 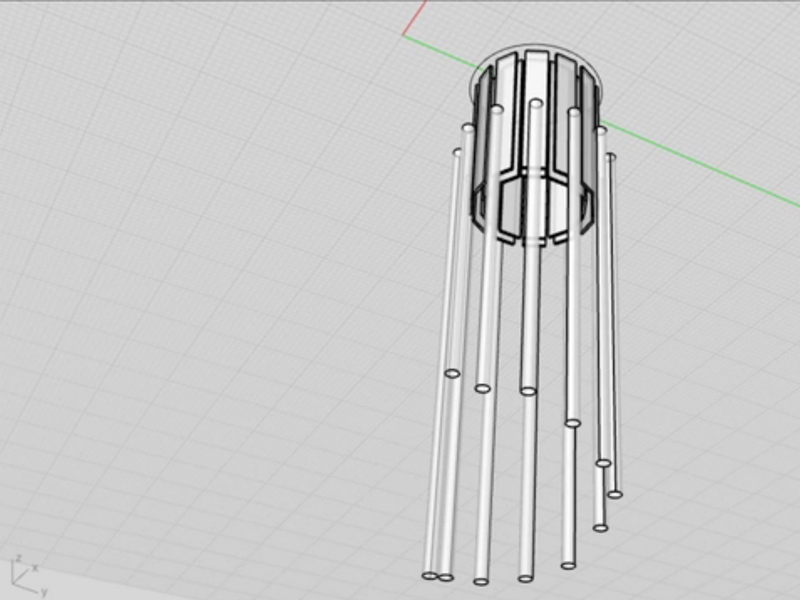 Helen was designing a set of wind chimes that would literally sway and chime in with the solar winds coming from our sun! The wind chimes would be a set of tuned aluminium tubes that would resonate using electronic magnets controlled by real-time data collected from the ACE satellite an hour away from earth. The project sounded amazing but unfortunately Helen was struggling to create the electronics and software that would drive the electromagnets. Each of the 12 aluminium tube would need to be driven at a different precise frequency in the audible range, the existing prototype used anArduino was able to resonate a single tube but it was very quite and wasn’t going to scale well for the 12 tubes. x-OSC sounded like the idea solution, it can generate up to 16 independent frequencies between 5 Hz and 250 kHz and could easily controlled by OSC messages. This was very exciting; the lunchtime talk was was the x-OSC’s first public appearance and we already had our first user project. We did some quick hacking with at the studio but didn’t have much luck so we arranged to meet again at my lab where we would have more tools and electronics to have a better go. After some playing around we found that we could get the loudest resonance of the aluminium tubes by fixed a small neodymium magnetic to the tube and driving a solenoid coil with some old 12 V, high-current motor driver boards I had. By driving the direction pin of the motor driver with the resonant frequency of a tube we could achieve the maximum amplitude of the oscillating magnetic field and maintain an average push/pull force on the tube of zero to prevent the tubes from getting stuck to the magnets. This arrangement would also allow a tube to be deliberately swayed by instead driving a DC signal to the solenoid. 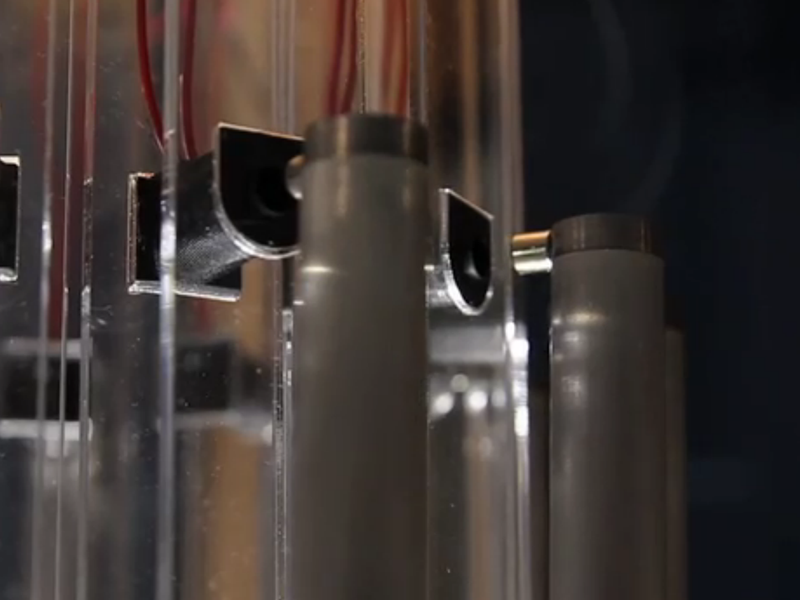 The video below shows these this working for different length tubes. We were really pleased with these initial results and it looked like Helen’s project was back on track. I assembled an array of 12 motor drivers with a x-OSC and Helen ordered a very large power supply along with lots more solenoids to hack into electromagnets. She presented the finished piece at the PMS a few weeks later. There is a really nice video documentary on Helen’s site describing the project. It is an amazing project and has got allot of people interested. There is an interview with Helen on the Physics World website and an article on Co.Design website with a photo gallery of the project. The piece was recently presented at Falmouth’s Fascinate Conference and will appear at more events in the next few weeks.